♬Liner Notes♬: It's a wild episode that zigs and zags all over the new musical landscape with the latest from A. Sinclair, New Pornographers, Laetitia Sadier, Deptford Goth, Guster + live sounds from Temples and Courtney Barnett... "How Many Ways" can we love new music? Notes: "Anyone who has been following the work of the New Pornographers since their 2000 debut LP Mass Romantic has to know what to expect from the Canadian supergroup by this point. Every one of their albums has been sequenced using the same precepts that Nick Hornby set up for mixtapes in the book High Fidelity: they start off with a corker of an opening track, rein it in on the next song and then move forward in incremental steps up or down in terms of energy to keep you (at least upon the first spin) guessing... the album’s brightest highlight, “Dancehall Domine,” a track that finds the perfect Venn diagram midpoint between early Roxy Music (listen for that off-kilter Eno-esque modular synth solo) and the Bay City Rollers. " The New Pornos gang closed out our epicly awesome Episode122 with the "corker" of a title track to their sixth record. Notes: "Guster will release their first album in four years, Evermotion, fearlessly experimenting with new instruments and collaborations to create their most vibrant album yet. Produced by Shins keyboardist/Black Keys bassist Richard Swift, who has produced records for Damien Jurado, Foxygen and Stereolab... recorded at Swift’s Cottage Grove, OR studio in three whirlwind weeks – the fastest the band has ever finished an album. “We recorded with one drum microphone, used whole takes, didn’t obsess over vocals or really edit things at all...It’s a raw version of our band.”" These boys just did an in-studio at my radio day job, too! Notes: "[Leeds band] Menace Beach share their name with a shonky early '90s Nintendo game... Happily, ‘Lowtalker’ – five songs, 14 minutes – is a bit smarter, and better, than that. ‘Fortune Teller’, EP opener and high point, suggests a college rock rework of My Bloody Valentine, while fragments of other alt-rock notables crop up elsewhere..."
Notes: "Caught somewhere between Byrds-ian jangle and Kurt Cobain’s dark humor, the young Melbourne, Australia singer-songwriter writes songs that ramble and breathe... Last fall, she packaged her two EPs together as The Double EP: A Sea Of Split Peas and picked up raves from Pitchfork and Rolling Stone. Barnett & the Barnetts stopped by Studio 1A while in town for Fun Fun Fun Fest..." Making her fifth stop at PUTV, CB is most definitely one of the breakout artists of 2014... and we played the studio version of this track back in December 2013! Notes: "Rough Trade have announced their top 100 albums of 2014, led by Temples' debut Sun Structures. The album, released back in February on Heavenly Recordings, drew widespread praise for its contemporary take on 1960s psychelia. At time of release, Gigwise described the album as "largely flawless" and "as strong a collection of guitar-based singles as you are likely to hear in 2014. " Another favorite of the year shows back up on PUTV for the fourth time - this time with a new live version! And expect to hear these guys again on our 'Best Of 2014' mix, too! Notes: "Piers Faccini, a gifted songwriter and producer, turned to cellist Vincent Ségal for an intimate recording of voice, cello and acoustic guitar. After a 25-year friendship they have finally been able to work together and the first song they wrote is the beautiful "Everyday Away from You, from their CD, Songs of Time Lost." We actually heard from Piers back on Episode076! Notes: "[Nashville] Multi-instrumentalist Olivia Jean earned her chops backing Jack White, Wanda Jackson, and Karen Elson, as well as fronting The Black Belles. Her debut solo recording, Bathtub Love Kills, has her playing just about every instrument." "Release from the Centre of Your Heart"
Notes: "Nothing was likely to be the same again for Laetitia Sadier and Stereolab following the death of their band mate Mary Hansen; they managed one more album in the wake of that devastating event before going on an indefinite hiatus in 2009. Since then, Sadier has released two solo records, pretty much in the style of her old band, plus formed a new, more countrified outfit in the shape of Little Tornados. Something Shines is Sadier’s third solo record and generally speaking it’s tied very closely to the style and themes of Stereolab’s work..." It's been two years since we last played LS, but she's yet another favorite making her fourth welcome visit to PUTV! Notes: "From how their name references the shady, defunct Deep Web drug market, it's fairly evident that Sasha Winn and Michael Collins (the [Baltimore] duo behind Silk Rhodes) have a pretty intense interest in psychedelia. Both members cut their teeth in more explicitly acid-addled affairs, with Winn functioning as an occasional live member of Collins' goofily punning psych-pop projects Run DMT and Salvia Plath. Now they're pushing their paisley pop music into realms more fitting of their new home on Stones Throw." Notes: "In 2006, the Austin Texas band I Love You But I’ve Chosen Darkness released their debut album Fear Is On Our Side, an LP full of driving, chiming, authoritative gothic rock — music that seemed to exist entirely out of time, sucking in all the light around it. Since then, nothing... Their sophomore album, and first in eight years, is called Dust. Ministry’s Paul Barker produced the album, just as he did with Fear Is On Our Side. First single and opening track “Faust” is a grand, towering, bloodthirsty thing, a song equal parts R.E.M. and Swans." 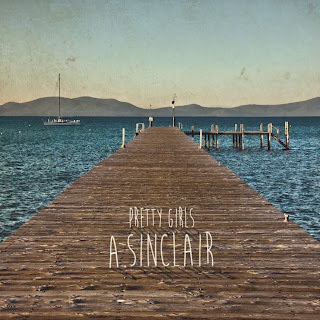 Notes: "After packing away his longtime project Frank Smith, Austin by way of Boston songwriter A. Sinclair, arrives unmarred and anew with Pretty Girls... it’s leaner production/arrangements along with some twists and turns that are both unexpected and uncharacteristic of Sinclair are welcomed... an enticing listen, further proving A. Sinclair to be one of Austin’s preeminent songwriters." Notes: "Formed in Lafayette, Louisiana in 2008, Brass Bed combine their love of ’70s power pop with a ’60s psychedelic feel. Their third and most recent album, The Secret Will Keep You, was released last year to wide acclaim... The band’s retro-tinged harmonies work perfectly with the fuzzed-out ’90s-style guitars, reminiscent of early Teenage Fanclub." Notes: "Mina Tindle’s baroquely-crafted take on pop music draws equally from the artisanal aesthetic of her home city of Paris and her stay in Brooklyn during the late-2000s indie rock boom... Inspired by Tindle’s Mediterranean roots, this year’s Parades further refines and expands Tindle’s arrangements and voice, both of which shine on the pulsating, eloquent “I Command”." Notes: "While country blues may not be the first genre that comes to mind when thinking of Seattle, local group GravelRoad takes on the Hill blues genre and adds their own Northwest rock ‘n’ roll spin... they earned their stripes backing the late Delta blues musician T-Model Ford... GravelRoad describes their sound on El Scuerpo as “if Black Sabbath had grown up in Holly Springs, Mississippi”..."
Damn, exhausted my connects to get into @runjewels at Hawthorne...@MusicMillennium to the rescue w/@therealelp @KillerMikeGTO meet & greet! #RTJ2 Thanks to @runjewels (@therealelp + @KillerMikeGTO) for being so awesome at the #pdx @musicmillennium in-store!